Remember the Magic 8 Ball? 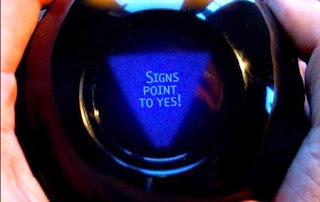 You ask it a yes or no question, shake it and get a "prediction"? My question for the last 4 years and 7 months has been, "Will I be authorized to work as a nurse and midwife in Norway?" On May 13th, an unexpected, but very welcome message appeared on SAKs homepage. They announced that they would now be evaluating educations from outside of the EU based on the ECTS (European Credit Transfer System) instead of simply counting classroom hours. This is what we have been arguing for years that they have been doing improperly, inaccurately, irresponsibly--the message that we argued in several appeals, with support from colleges and nursing professors, nursing organizations, lawyers and telling to the media and politicians left and right. It appears that SAK has finally listened and will be evaluating the educations of foreign nurses with the same measuring stick that the colleges and universities in Norway measure them. You can throw it into Google translate to get the details, but translated below is a transcript of the report that aired on a regional news broadcast that night, with a brief appearance by yours truly. Now SAK is changing the rules for authorization of nurses educated outside of the EU. “The changes are based on that we are now giving great weight and credit for the entire course of study and not just classroom time, and are also looking at the total learning objectives and learning goals, ” says Anne Herseth Barlo, the director of SAK. Now SAK will evaluate the competence of its applicants in terms of total credit hours of nurses, like the nursing educational programs in Norway do. “On behalf of the work that has been done on this case thus far, this is very good news, because this conforms with how this whole time we have internally evaluated applicants/students here at the College in Buskerud and Vestfold, and as far as I know, throughout the college and university system throughout all of Norway,” said Heidi Kapstad, dean of the College in Buskerud and Vestfold. Now SAK promises to reverse the decision on hundreds of applicants who have been denied and look at their application again, for the applicants who request it. In the last 5 years, Emily Stange, with a solid American midwife education, has waited for approval. “I am very excited. It’s going to be very nerve-wracking in the next few days when I come to check the mail,” says me. “From what we have evaluated, and I say this on behalf of myself. . . I have signed off on Emily’s evaluation, and have gone through all of the papers, and I can’t say anything other than Emily is approved in Norway,” said Heidi Kapstad of the College in Buskerud and Vestfold. That last line in particular is super positive, but unfortunately my dear supporter Heidi Kapstad is not the one that gets to sign off on my authorization. A powerful and influential woman she may be, and having that statement on record is huge, but SAK still remains in power. I sent and received an answer from my case manager, stating my application would be finished early this week. . .
We are feeling very, very optimistic, and now mostly anxious about just the midwife authorization--the nursing authorization is almost certainly approved. It is Tuesday. The mailbox is still empty. I'm so happy for you! Congratulations! I wish you good luck for your first job as midwife in Norway! Well, now we know how it all turned out----CONGRATULATIONS, Emily!!! The amount of time, effort, anguish, and frustration this has cost you and Erik is immeasurable, I think, but look at what you both have achieved! You have changed rules that will affect so many lives here in Norway, not just other skilled immigrants but all of the people living here who will benefit from the education and experience you all bring. You deserve so much credit and thanks. THANK YOU Emily and Erik!